Paul Hockey’s Mount Everest journey, determination to succeed and his ability to challenge the dream-takers are all extraordinary. Paul’s positive attitude and self belief have seen him defy the odds and perceived logic for an amputee, time and time again. Paul travels around Australia and internationally as a motivational speaker, and in doing so is increasing awareness for cancer & cancer research. Having lost his mother, father, stepfather, aunt and brother in-law to cancer, Paul is passionate about making a difference. His enthusiasm, courage and mental strength are truly inspirational. Paul explains how his very diverse martial arts background allowed him to achieve any task or goal by constantly using his improvise, adapt and overcome approach.He lives by his motto “Never give up…Never ever give up!” and despite losing his right arm to cancer at just three weeks of age, Paul Hockey became the first disabled person to climb Mount Everest from the North side. 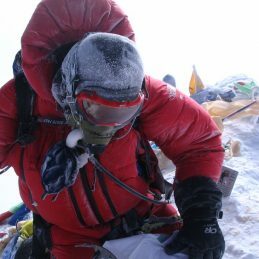 He stood on the summit of the world’s highest mountain on Sunday the 5th of June 2005 at 7.42am. What he does is almost unbelievable, yet true. Having only one arm is no disability for Paul. His study and training in martial arts has taught Paul to continually challenge himself. He pushes his mental, physical and spiritual toughness to their absolute limits.